Since this last "weekend" was the 4th of July, fireworks were happening... pretty much everywhere. This is the story of what I did with my Monday/Tuesday. This wasn't the first time I've worked a professional show. 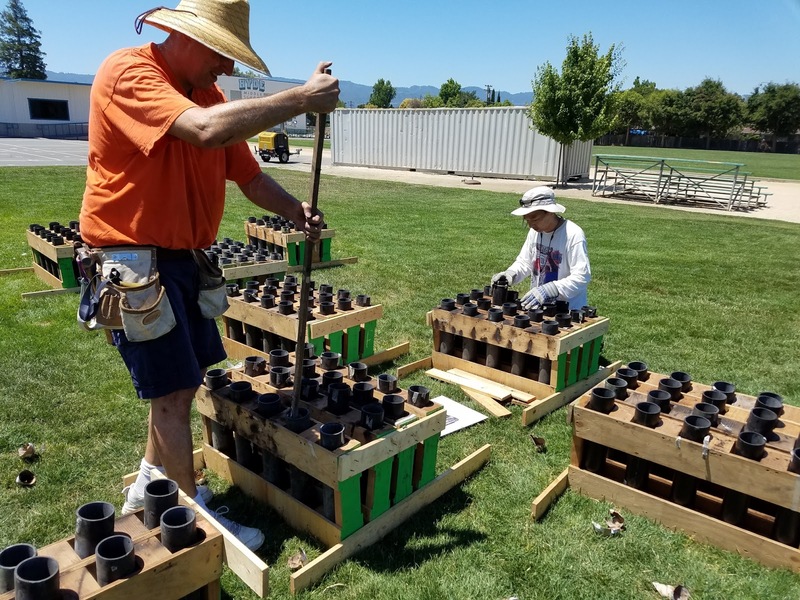 I actually worked one last year, then promptly never got around to writing about it, so sorry about that, but the main question people ask there is how did I get into working professional fireworks shows once a year? The answer is pretty simple: I answered the phone. 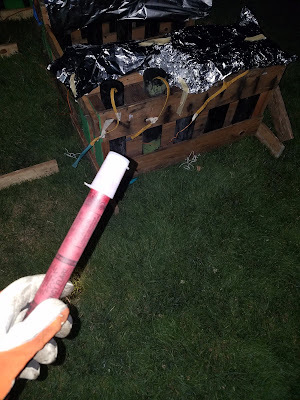 Laura (friend who happens to be a licensed pyro): "Kenneth. I know you like to do crazy stuff. 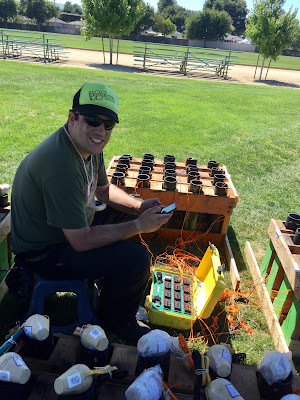 My friend needs more hands to work a fireworks show. Would you be interested?" Me: "Yes. yes. Matter of fact, yes I would. Dear god, yes. Yes." Fast forward to this year, and she hadn't heard anything too terrible about my performance last year, so she invited me to work the City of Cupertino show with her this year, which is what I'm detailing here. Monday (day before show), 10AM: The box truck arrives on site. 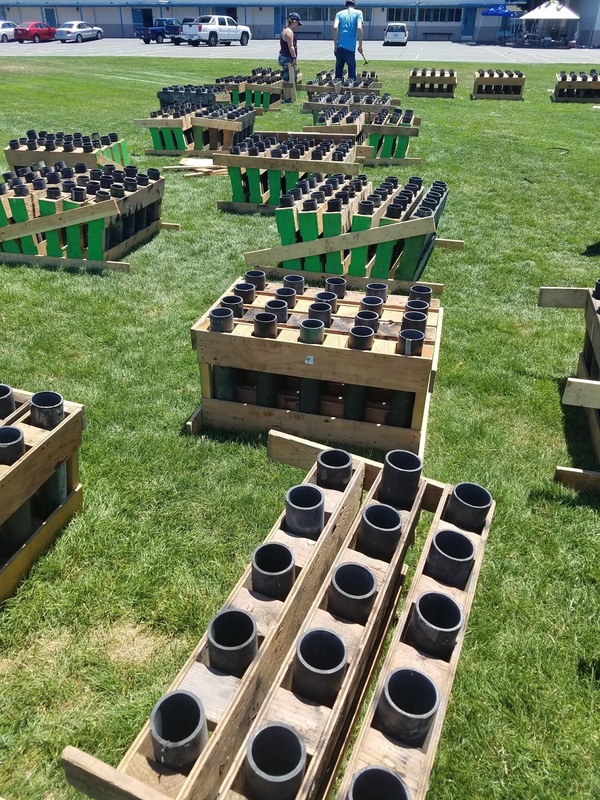 This truck is carrying the racks of tubes for the shells, but not the actual fireworks. 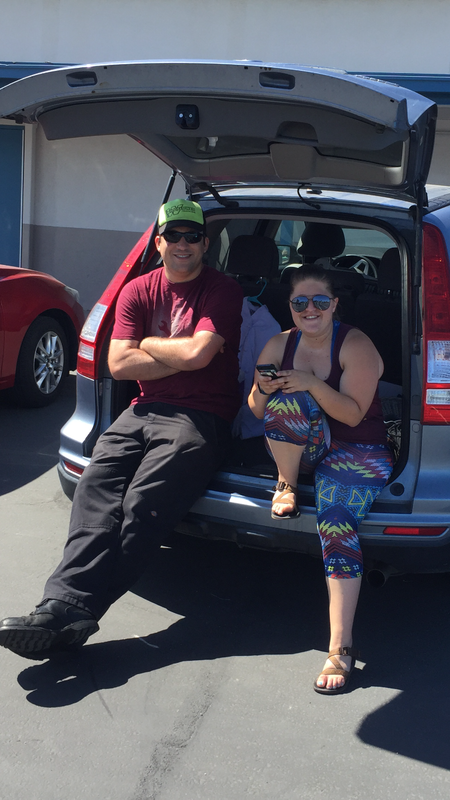 The first day is pretty much all just hard labor. 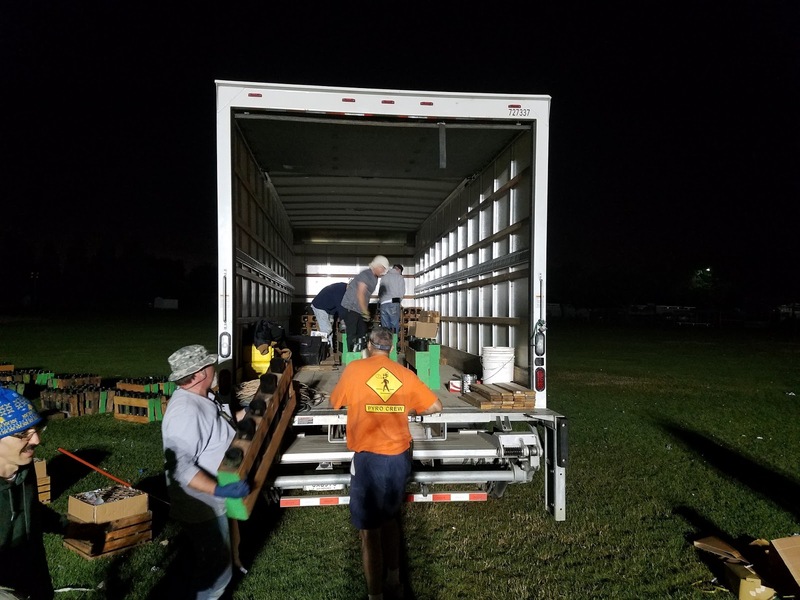 Each of these plywood + 2x4 racks holds five 3" HDPE guns, and they all need to go from the box truck to the lawn. 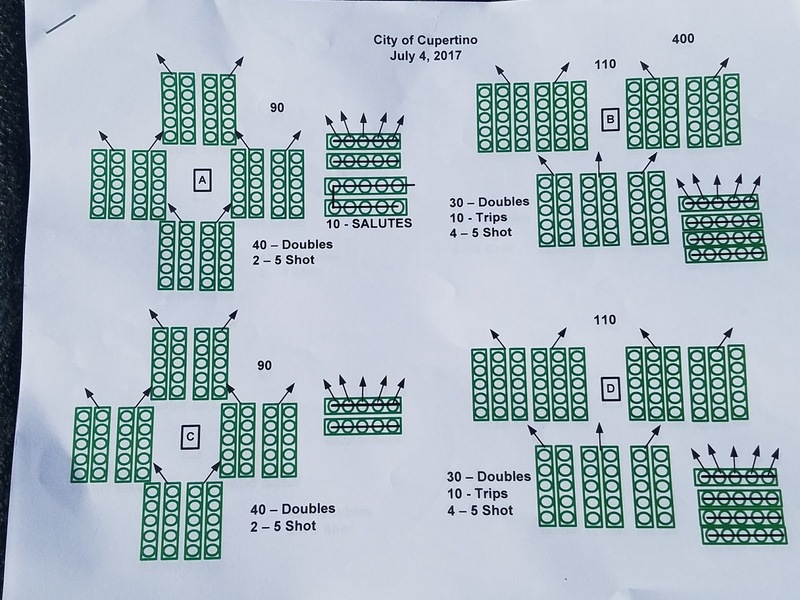 A few packets of the show plan are floated around showing how many racks needed to be in each of the nine clusters (A-H) and how they should be grouped (set of three, pairs, etc). 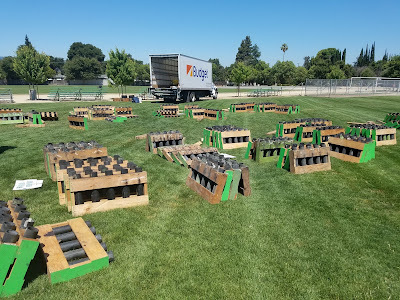 Once put in vaguely the right location, all the racks need to be nailed together so they don't fall over when the shells fire. 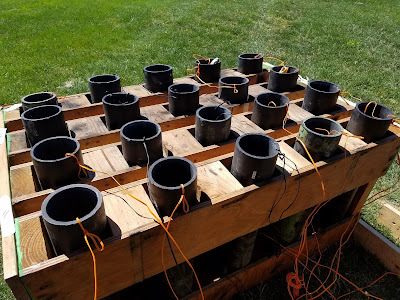 I'll freely admit that I'm certainly not a pyrotechnics expert yet, but I was pretty quick to get on-board with the desire for the shells to go up first, and then explode. While nailing them together, we also accounted for the expected wind direction with a bit of a general tilt to the right and the desire to give the shells some level of spread, so notice how we mounted them with some angle spread in each block. After lots and lots of nailing, it was time to clean out the guns so they'd be ready to get loaded the next day. The last show who used these inevitably left all sorts of debris in the gun which we don't want below our fireworks, so it's a matter of checking each tube and cleaning it out. After a hard five hours, we were pretty much ready for the fireworks the next morning and called it a day. 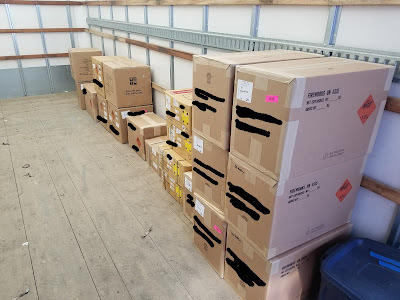 Show day, 10AM: The product arrives in another box truck. 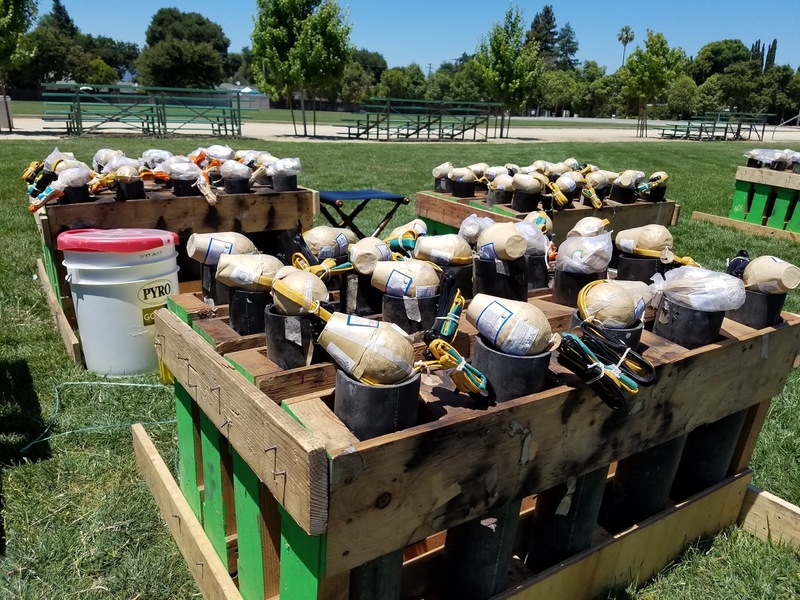 860 pounds of glorious 1.3G explosives. 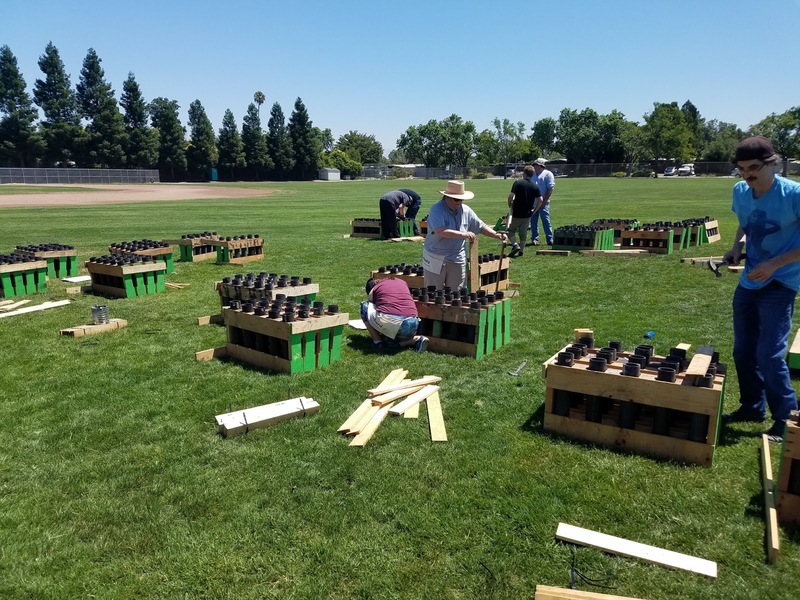 Due to the limited size of the field we were firing this show in, the show was limited to 3" shells, so they weren't going to be going particularly high, but we were making up for it in shear quantity. 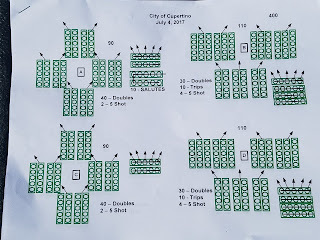 950 loose shells, plus another 150 in "cakes," which are 25 shell clusters that just fire one after another, generally as the final crescendo to and during the finale. 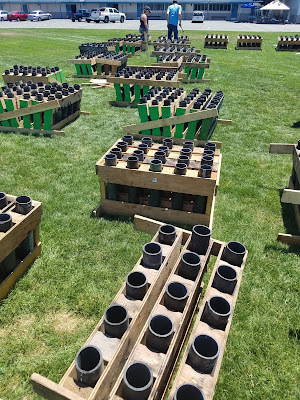 We now had 11 hours to unpack all the fireworks, sort out which guns in which clusters each one was loaded in, and set them all up to get launched during the ~20 minute show. 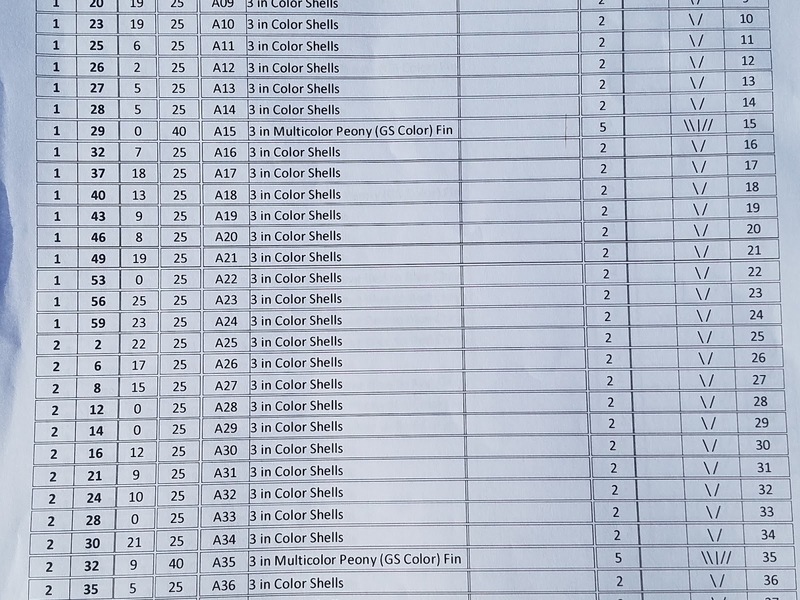 The cakes are real easy since they come pre-packaged, but we've got 950 loose shells that need to be laid out. Before loading them in the guns, we place them on top of each gun for the inevitable shuffling of shells when we come up short of one kind and have a long string of the same kind or color in one of the blocks which would be visually boring. Swapping some of these for some of those in the next block, etc etc. 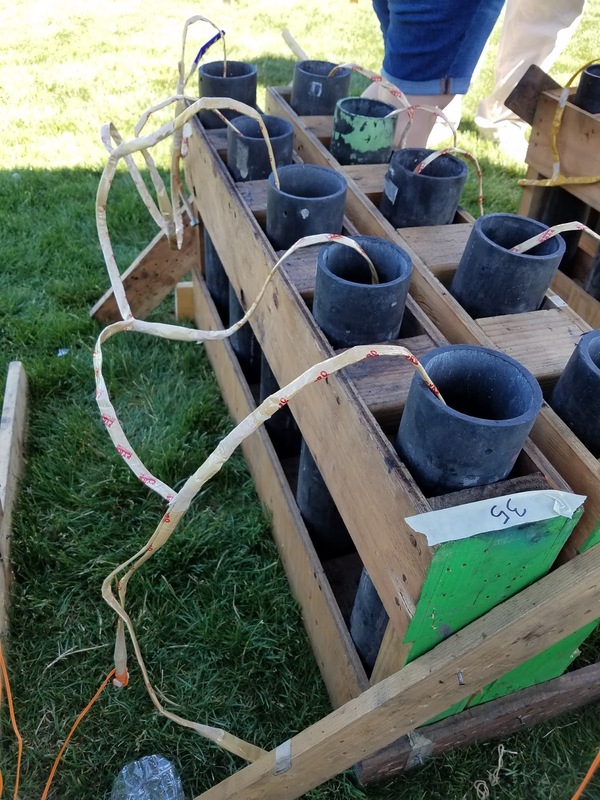 Notice how each shell is pre-wired for both electronic firing via wire (which is what this show is using) and manual firing via the quick match fuse. Quick-match is neat stuff. It's gun powder infused cord, which on its own burns relatively slowly (kind of like how everyone expects "fuses" to burn), but once you wrap it in a paper/tape wrapping to contain the burning gun powder, it becomes a propagating explosion, which runs down the quick-match at several hundred feet per second. 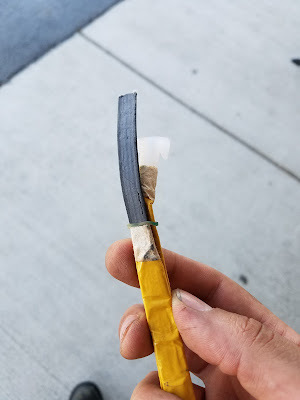 When you want to manually set off a shell, route this stuff out the top of the gun, light the few inches of unwrapped fuse, DUCK, and it almost immediately goes up. Last year, I helped fire a show entirely manually, which literally meant that when the show started, the operator handed me a 20 minute road flare, and told me to start on one end of the row and while waving the flare around try to only launch one shell at a time. This show was instead an electric fired show, so we were using the electric squib wired to each shell. 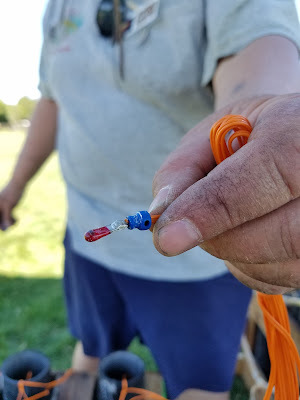 This consists of fine gauge zipcord and what looks like a match head which has a resistive element in it to set it off when you pass enough current through it. So now we've got ourselves a bit of a problem. We have 950 shells with electric squibs, and we need to wire all of them back to one place to be able to fire them all off. Thankfully they're all getting fired off in groups of two, or three, or more, so we can wire each group in series, but we're still talking about a LOT of wires. 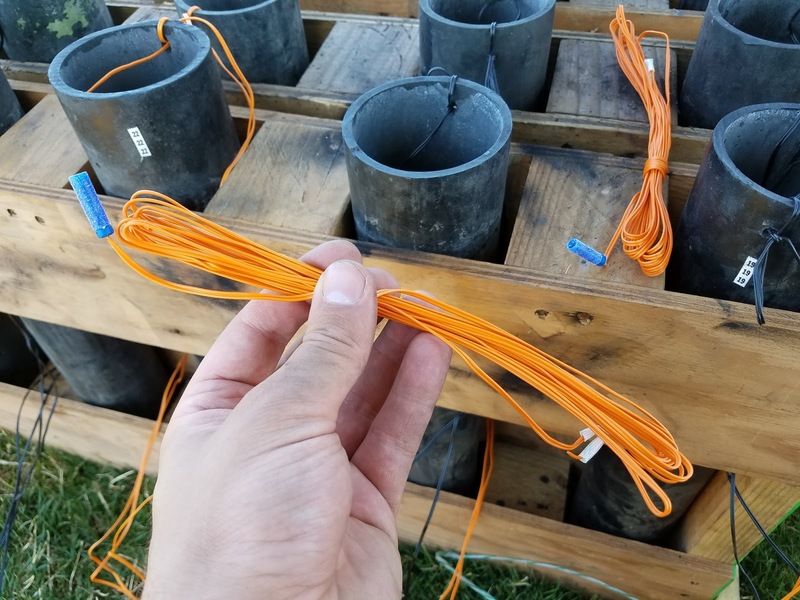 For the larger 5-10 shell clusters, we don't bother wiring a squib to each shell, but actually splice them together using quick-match and one or two squibs at the end. So we need to wire all the shells. 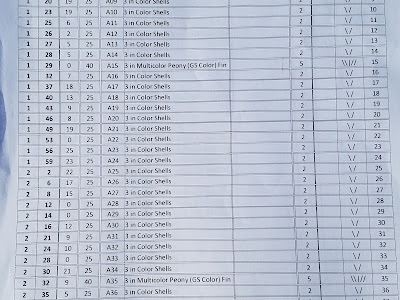 This is done off of an address sheet where each channel on each breakout box is listed with how many of which type of shell should be attached to it. So we wire, and wire, and wire. 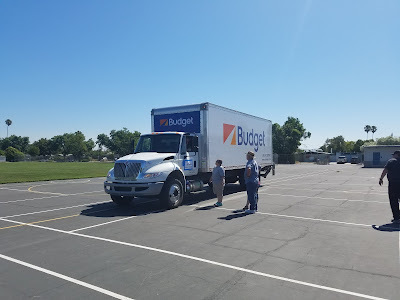 Thankfully, others on the team were smart enough to bring pop-ups, so we were able to do this in shade, which was important, since this was the vast majority of the day. And wiring and wiring and wiring... Seriously, I meant it when I said a LOT of wires. This is just one of the breakout boards. 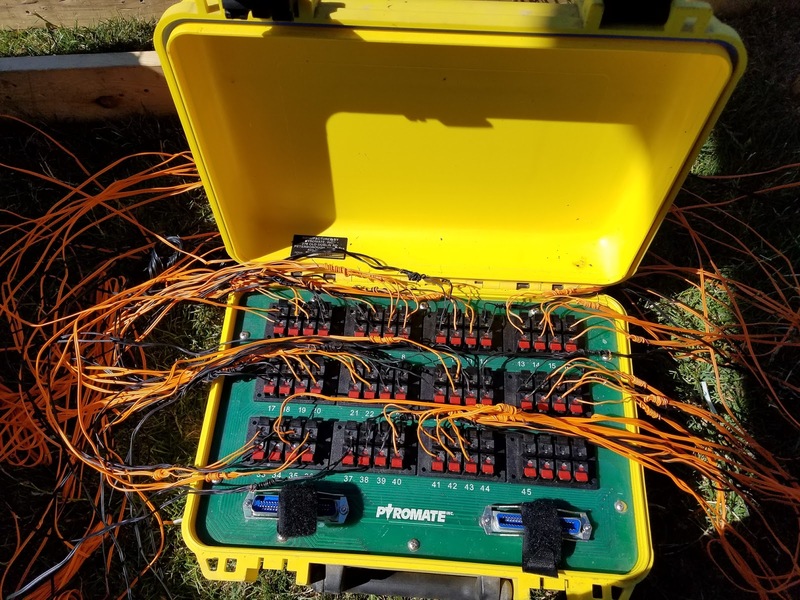 Each breakout has 45 channels, which are simple spring clips, and best I understand they all share 5 common ground returns through 50 pin Centronics connectors to the trunk lines back to the firing panel. 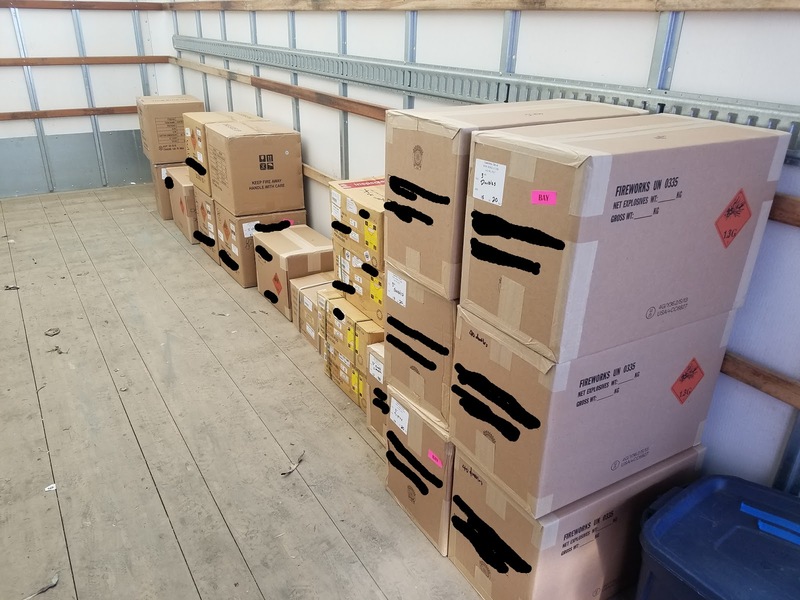 Some of my Twitter followers rightfully so gave me a hard time for falling short of my usual wire management standard here, but it helps when you know that you're literally going to be blowing it up in a few hours and then frantically shoving it in trash cans. After running the trunk lines back to the firing panel, we can do a continuity check on all the shells to make sure between the series wire splices, spring clips, breakout boxes, trunk lines, and the firing panel we don't have any opens. Of course, we had several opens (see channel 3 in the photo above), so it was several iterations of checking the panel, noting down the open channels, turning off the panel, running out and finding the broken wires, fixing them, then clearing the field, then checking the panel, and figuring out which other wires we broke during the last round, etc. etc. So this takes us up right to the show. 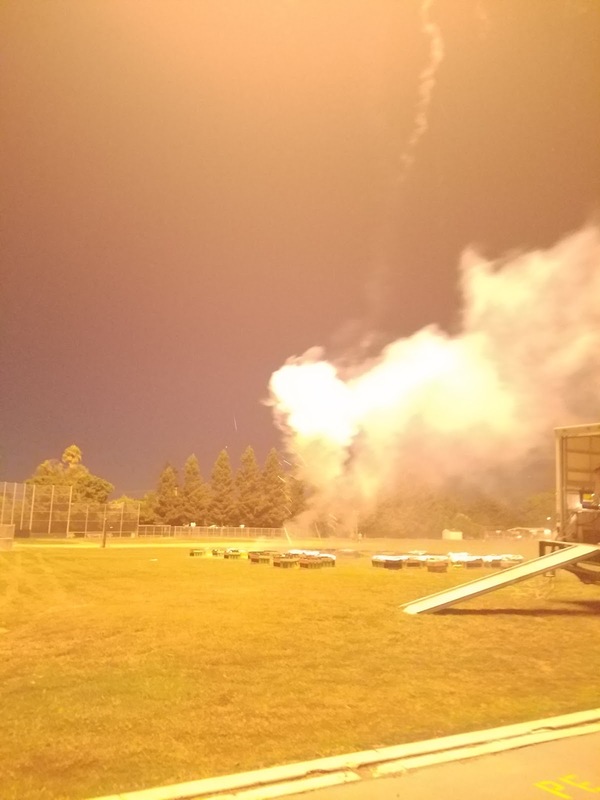 To start the show, we light off one, then a second shell, to get everyone's attention and then show where the fireworks are going to be coming from. 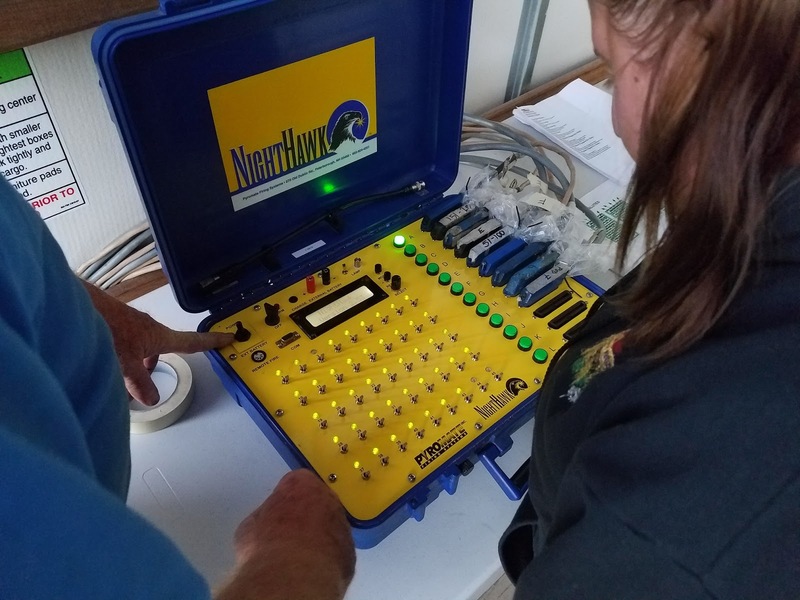 We then give everyone a minute or two to get themselves settled in and facing the right direction, before starting the electronics and running the show. Yes. That is a photo of my hand, with a road flare. 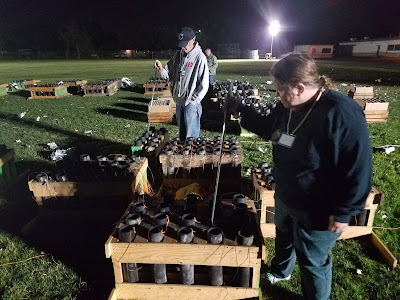 I was picked to set off the two starter shells, so I got to walk out into the middle of a lawn, filled with explosives wired to go off, light a road flare, and touch it to the first two fuses. So then the show is over, and we need to go clean up the little mess we've made in the middle of some grounds keeper's pride and joy setting off 1100 explosives. Fire up the lights, and the hunt is on! The hunt for the duds. 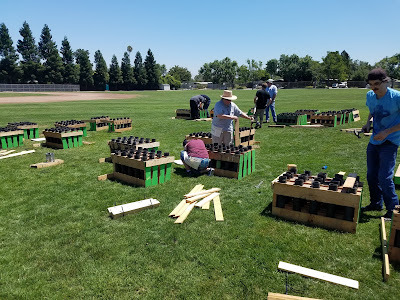 We put a lot of effort into making sure that all the fireworks went off during the show, since that's pretty much the whole point of a fireworks show - it going up and being entertaining. Now it is time to find the shells which didn't entirely subscribe to this same objective for this evening and hadn't felt compelled to launch themselves into the air and the whole blowing up thing. Poke a stick into each tube, check to see that it's empty, and pour out the shells that are still left and collected them in a pile. I know. Very technical. Of course, getting another truck out here which is placarded and licensed to transport 1.3G explosives for just the six duds we had would be a bit of a waste of time, particularly when we've got 950 perfectly good launching tubes already set up, a fire marshal who's being a good sport, and 15 pyros who came to set off some fireworks. 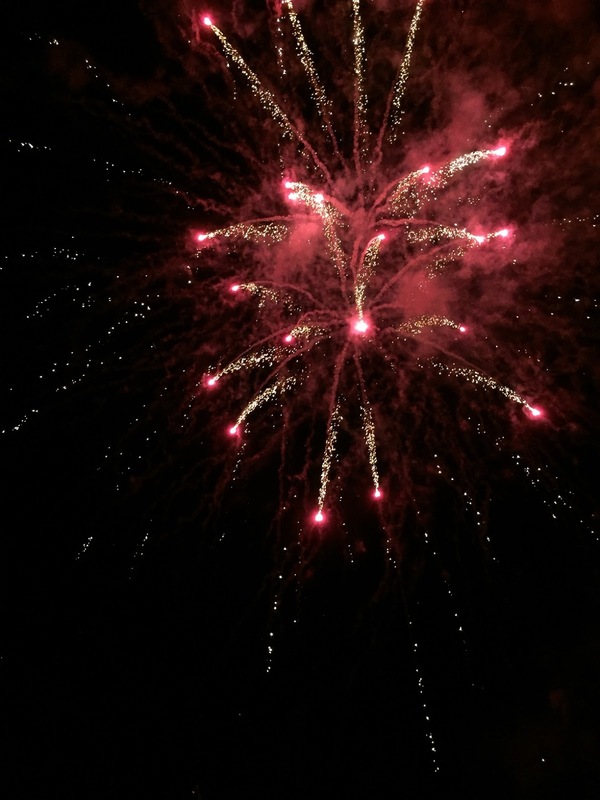 Have you ever wondered why shows set off a few fireworks about a half hour after the show ends? This is why. They were just missed during the show and the operator really doesn't want to have to carry them home. 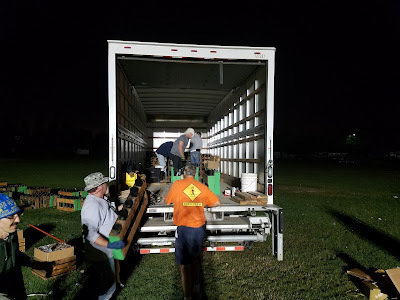 So it's now about 10:30PM, the fire marshal and our licensed operator have agreed that the explosives are all gone, and it's now a frantic rush back onto the field with hammers to dismantle the carefully nailed together racks and load them all back into the box truck. 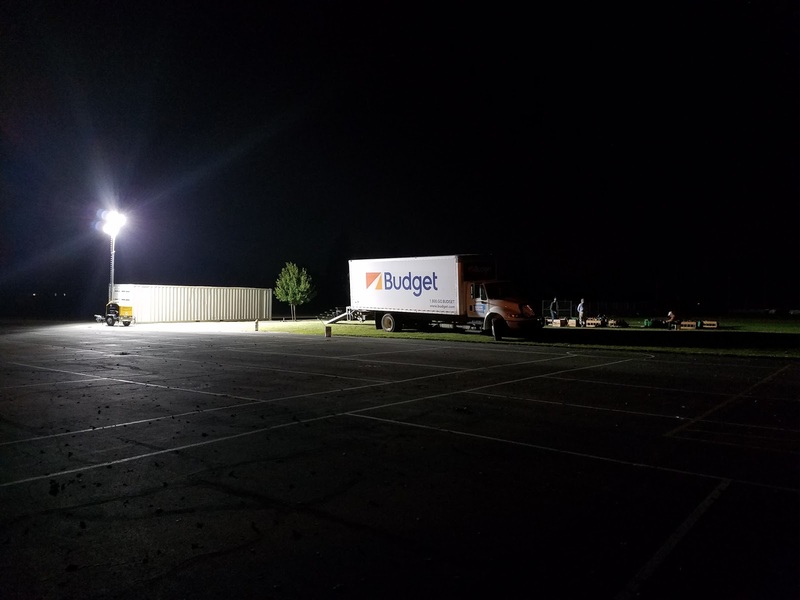 This takes us to just shy of 1AM, at which point it's some hearty hand shakes, hugs, and a wave farewell until next year. Be careful out there. Accidents do happen and I'd be disappointed if I couldn't come back to your blog for new content.